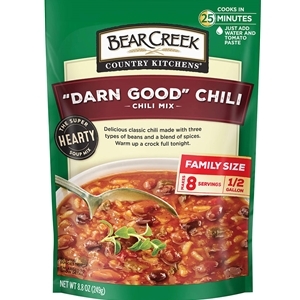 Bear Creek "Darn Good" Chili is not your Grandma's chili! "Darn Good" Chili is mildly spicy, a rich combination of beans, vegetables and rice smothered in chili tomato sauce. Bring 7 cups of water to a rolling boil. Whisk in chili mix and 1 can (6 oz) tomato paste. Reduce heat to medium and simmer uncovered 20 - 25 minutes, stirring occasionally. Salt and pepper to taste. Store in a cool dry place. Pinto Beans, Red and Black Beans, Onions, Enriched Long Grain Rice (Niacin, Iron, Thiamine Mononitrate, Folic Acid), Natural Beef Flavor, Hydrolyzed Soy Protein, Corn Starch, Sugar, Bell Peppers, Chicken Fat, Beef Stock, Maltodextrin, Citric Acid, Celery, Salt, Garlic, Chili Peppers, Natural Flavors, Spices, Caramel Color, Disodium Inosinate and Disodium Guanylate (Flavor Enhancers). Really like it. Not spicy at all. I added 1 1/2 lbs of ground round and 1/2 chopped red onion. This is delicious! Omg I added meat and salsa and was pleasantly surprised! Best packaged chili mix ever tasted! Added 1 lb. of browned and drained ground round and 1 can of undrained diced tomatoes. This is GREAT starter chili. We add corn, salza (to make it a little hotter), and other things at different times just to make it a little different each time. Fast and easy and delicious...and not a big pot left over to find a place for it in the frig. I've had several friends ask for my "recipe" when we serve this chili! I always tell them "It's Bear Creek Darn Good Chili... they're amazed it's a mix. Unfortunately, our local Kroger store no longer carries it so I'm ordering it online.